The term tetrarchy (from the Greek: τετραρχία, tetrarchia, "leadership of four [people]")[lower-alpha 1] describes any form of government where power is divided among four individuals, but in modern usage usually refers to the system instituted by Roman Emperor Diocletian in 293, marking the end of the Crisis of the Third Century and the recovery of the Roman Empire. This tetrarchy lasted until c. 313, when internecine conflict eliminated most of the claimants to power, leaving Constantine in control of the western half of the empire, and Licinius in control of the eastern half. As used by the ancients, the term describes not only different governments, but also a different system of government from the Diocletianic arrangements. The Judaean tetrarchy was a set of four independent and distinct states, where each tetrarch ruled a quarter of a kingdom as they saw fit; the Diocletianic tetrarchy was a college led by a single supreme leader. When later authors described the period, this is what they emphasized: Ammianus had Constantius II admonish Julian for disobedience by appealing to the example in submission set by Diocletian's lesser colleagues; Julian himself compared the Diocletianic tetrarchs to a chorus surrounding a leader, speaking in unison under his command. Only Lactantius, a contemporary of Diocletian and a deep ideological opponent of the Diocletianic state, referred to the tetrarchs as a simple multiplicity of rulers. In 305, the senior emperors jointly abdicated and retired, allowing Constantius and Galerius to be elevated in rank to Augustus. They in turn appointed two new Caesars — Severus II in the west under Constantius, and Maximinus in the east under Galerius — thereby creating the second Tetrarchy. The four tetrarchs based themselves not at Rome but in other cities closer to the frontiers, mainly intended as headquarters for the defence of the empire against bordering rivals (notably Sassanian Persia) and barbarians (mainly Germanic, and an unending sequence of nomadic or displaced tribes from the eastern steppes) at the Rhine and Danube. These centres are known as the tetrarchic capitals. 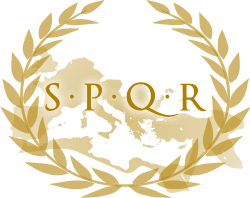 Although Rome ceased to be an operational capital, Rome continued to be nominal capital of the entire Roman Empire, not reduced to the status of a province but under its own, unique Prefect of the City (praefectus urbis, later copied in Constantinople). 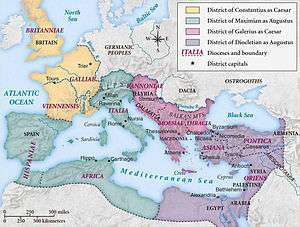 In terms of regional jurisdiction there was no precise division between the four tetrarchs, and this period did not see the Roman state actually split up into four distinct sub-empires. Each emperor had his zone of influence within the Roman Empire, but little more, mainly high command in a 'war theater'. Each tetrarch was himself often in the field, while delegating most of the administration to the hierarchic bureaucracy headed by his respective Pretorian Prefect, each supervising several Vicarii, the governors-general in charge of another, lasting new administrative level, the civil diocese. For a listing of the provinces, now known as eparchy, within each quarter (known as a praetorian prefecture), see Roman province. However, it appears that some contemporary and later writers, such as the Christian author Lactantius, and Sextus Aurelius Victor (who wrote about fifty years later and from uncertain sources), misunderstood the tetrarchic system in this respect, believing it to have involved a stricter division of territories between the four emperors. Under the Tetrarchy a number of important military victories were secured. Both the Dyarchic and the tetrarchic system ensured that an emperor was nearby to every crisis area to personally direct and remain in control of campaigns simultaneously on more than just one front. After suffering a defeat by the Persians in 296, Galerius crushed Narseh in 298—reversing a series of Roman defeats throughout the century—capturing members of the imperial household and a substantial amount of booty and gaining a highly favourable peace treaty, which secured peace between the two powers for a generation. Similarly, Constantius defeated the British usurper Allectus, Maximian pacified the Gauls, and Diocletian crushed the revolt of Domitianus in Egypt. A chart of the diarchy of 286-293 and subsequent tetrarchy of 293-305. 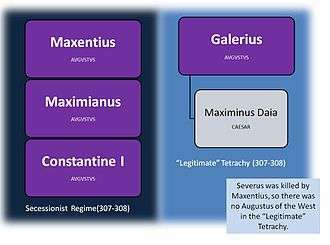 A chart of the tetrarchy from 305 to 306, after the retirement of Diocletian and his colleague Maximian, and the accession of Constantius and Galerius. A chart of the tetrarchy from 306 to 307. After the usurper Maxentius declared himself Caesar, Augustus Severus marched on Rome but was defeated when his troops deferred to Maxentius. Severus was later executed in the same year, 307. Maxentius, and his father and former Augustus, Maximianus (Maximian), declared themselves Augusti later that year. Maximianus joined the secessionist regime of his son, Maxentius, in Italy. Constantine joined the secessionist alliance by marrying Maximianus' daughter, Fausta, and by supporting Maxentius in Italy. However, Constantine remained neutral with Galerius, but he still took the title of Augustus in the secessionist regime. After the retirement of the two Augusti succeed the both previous Caesares and appoint two new Caesares. 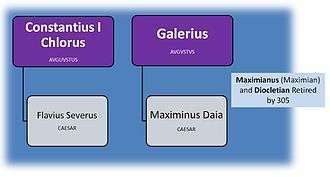 Maximinus Daia is the nephew of Galerius Galerius. 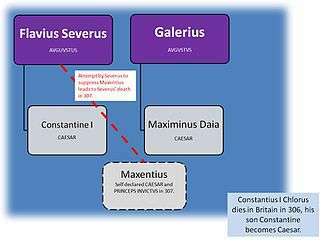 After the death of Constantius his legions proclamate his son Constantin to be the new Augustus, but Galerius elevates Severus to be the new junior Augustus and compensates Constantin with the grade of Caesar. After the death of Severus it isn't Constantine who moves up in the higher title. In the emperor's conference of Carnutum Diocletian decides that Licinius will be the new Augustus of the West. After the death of Galerius he was succeeded by Maximinus Daia in the rank of an Augustus of the East, but is crowded by Licinius, who wants to have the status of the senior Augustus. Maximinus appoints firstly no new Caesar, although it was assumed, that this position should later on be filled out with the son of Severus, Flavius Severianus, or at least he was scheduled for this position. Shortly before the turn of the year 316/317 for a short-term exists the situation, that both Augusti Constantin and Licinius appoint again a Caesar. If both want to give the appearance of a continuity of the Tetrarchy is also unclear as the date stamping which could also be the turn of the year 314/315. The tetrarchic system is at its end, the dynastic system has won. Both Augusti appoint her own sons to co-emperors, Constantin even two of his sons. Short before of his end Licinius appoints the General Martinianus on 3. July 324 to his co-emperor. ↑ Historian David Potter translates the term as "gang of four". See idem., Constantine the Emperor (Oxford: Oxford University Press, 2013), 1. ↑ The chronology has been thoroughly established by Kolb, Diocletian, and Kuhoff, Diokletian.